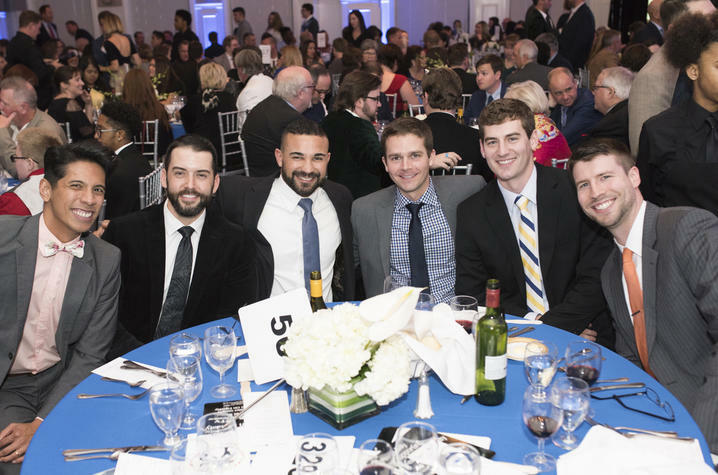 Attendees of the 2017 Feast on Equality John Eric Novosel-Lingat, Weston Lyons, Raul Vasquez, James Smith, Josh Combs and Nathan Novosel. LEXINGTON, Ky. (Nov. 20, 2018) — Tickets are on sale now for the third annual Feast on Equality banquet, benefiting the University of Kentucky Office of LGBTQ* Resources. The event is scheduled in UK's Gatton Student Center Ballroom on Friday, Dec. 7. The UK Office of LGBTQ* Resources’ new location in the Gatton Student Center provides expanded support and resources to the LGBTQ* campus community. Proceeds of the Feast on Equality banquet support education and research; grants and scholarships; and other forms of student support, including health and wellness, outreach services, and institutional policies that create a more inclusive environment for the university’s LGBTQ* community. A 501c3 nonprofit organization, Feast on Equality’s purpose is to raise funds for at-risk LGBTQ* youth by hosting signature fundraising events to engage the community and create awareness surrounding the issues that the community’s LGBTQ* youth face. The Feast on Equality evening begins with an open-bar reception at 6 p.m. with entertainment by a trio of students who are pursuing their musical theatre certificates at the UK School of Music and UK Department of Theatre and Dance. This year’s Feast on Equality guest speaker is Landon Foster, starting punter for the UK Wildcats (2012-2015). Events collided in his senior year that prompted Foster to turn down opportunities with the NFL. Instead, he pursued a career in financial services by earning his graduate degree at the Owen Graduate School of Management at Vanderbilt University. A few months ago, Foster committed himself to promoting diversity in sports and business by coming out in Outsports and YouTube. After the banquet, attendees will be invited to bid in an auction at various levels of support for LGBTQ* Resources. “It's a fun and fast-paced way to raise as much money as possible in just a few short minutes,” Poston said. The 2017 event raised more than $80,000 for the LGBTQ* Resources, which was more than double that the prior year. Poston hopes this year’s Feast on Equality will raise even more. There are two options for becoming a table host: (1) purchase a table of eight seats for $750 and invite friends, neighbors, and colleagues, or (2) encourage guests to purchase individual tickets ($95 per person), to be seated together at your table. If using option 2, send an email to the event chairman, Tim Burcham, at tim@burchamsolutionsgroup.com to indicate that you are hosting a table and the names of the guests to be seated there. Tables can be purchased here: www.eventbrite.com/e/feast-on-equality-university-of-kentucky-2018-tickets-46908385243?aff=eac2. Individual tickets are available for $95. To be seated with others who are also purchasing individual tickets, make a note during the purchasing process. Organizers will do their best to accommodate requests. Individual tickets can be purchased here: www.eventbrite.com/e/feast-on-equality-university-of-kentucky-2018-tickets-46908385243?aff=eac2. During the event, a live auction will invite guests to bid at various levels of financial support for the LGBTQ* Center. Cash, checks and credit cards are accepted at the event. Following the event, Soundbar will host an After Party for attendees where the fundraising total will be announced and celebrated. Soundbar is donating the proceeds of the After Party to Feast on Equality. For more information about corporate sponsorships, visit www.uky.edu/lgbtq/sponsorship-opportunities. For more information about the event, contact event committee chair Tim Burcham at 859-699-2820 or the UK LGBTQ* Center Director Lance Poston at 859-218-4816 or visit the website at www.uky.edu/lgbtq/.